This book develops a sociologically informed theory of constitutionalism in the global realm, addressing both national and transnational forms of constitutional ordering. The book begins with the argument that current approaches to constitutionalism remain tied to a state-based conception of constitutions, and overlooks underlying structural transformations that trigger the emergence of constitutional forms of ordering. 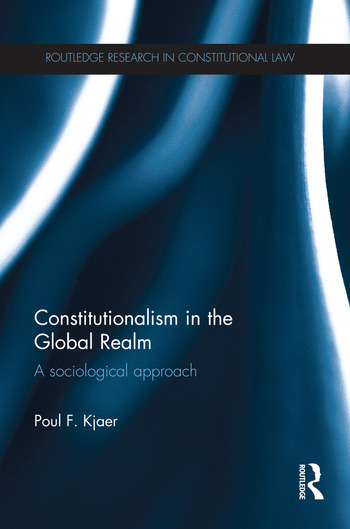 Poul F. Kjaer aims to address this shortcoming by offering a sociological and historically informed analysis of the evolution of constitutionalism in the face of globalisation. The analysis contextualises on-going constitutional developments through the use of a long-term historical perspective, which is capable of highlighting the impact of deeper structural transformations unfolding within society. The book looks at the ways in which national and transnational legal forms have evolved alongside one another. It demonstrates that the formation of global constitutions has not resulted in a corresponding decrease in the power of nation states, but instead, legal and political aspects of both the nation state and the transnational have been reconfigured and intensified in a mutually supportive manner. In combining insights from a range of fields, this interdisciplinary book will be of great interest to students and scholars of constitutional law, sociology, global governance studies, and legal, social and political theory. Poul F. Kjaer is Professor at the Department of Business and Politics, Copenhagen Business School. He has published widely on social and legal theory, European integration and global governance. He is the author of Between Governing and Governance: The Emergence, Function and Form of Europe's Post-National Constellation (Oxford: Hart Publishing, 2010).